I’ll be the first to admit I’m addicted to stationary. I cant walk past any place that has a whiff of ink and paper and not head in , even though I don’t need anything. 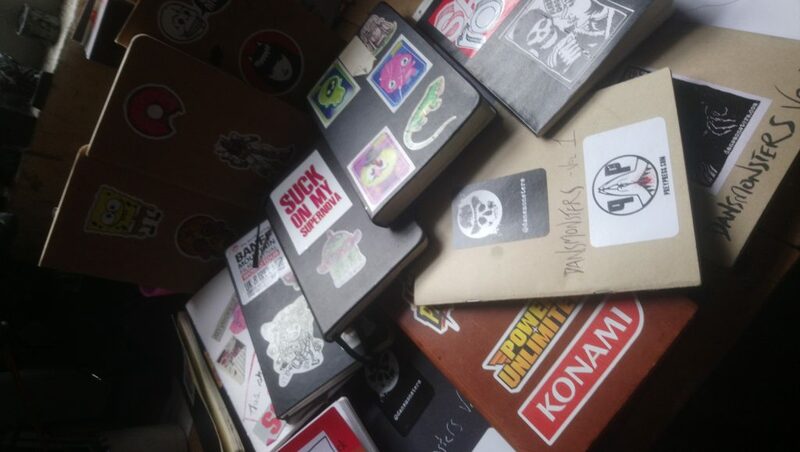 I recently bought another three sketchbooks to add to the box full of blank ones I already have. There is just something about them though. A terrifying thrill as you open the blank pages, pen at the ready, hoping to all things holy and unholy your not going to make a total crap hole out of it. Nothing worse than a ruined sketchbook. I’ve thrown them away because the first image was so bad. What an Idiot!! I have an old art paper storage cupboard that I retrieved from a skip in my wife’s school that has an entire drawer dedicated to old sketchbooks. Many evenings, if I’m struggling for inspiration I’ll look through them. Ideas that I’ve never finished, never followed through, old shopping notes, films to watch or books I’ve read. It’s like a time machine I suppose. I’ve actually thrown away more that I can remember and now that I’m moving house, I’m having to decide what to do with them again. It’s a hard choice. Worst of all, I dread to think what the binman would think if he actually glanced upon the contents!! I’d probably end up with the police on my doorstep thinking I was a crazed serial killer or something!!! 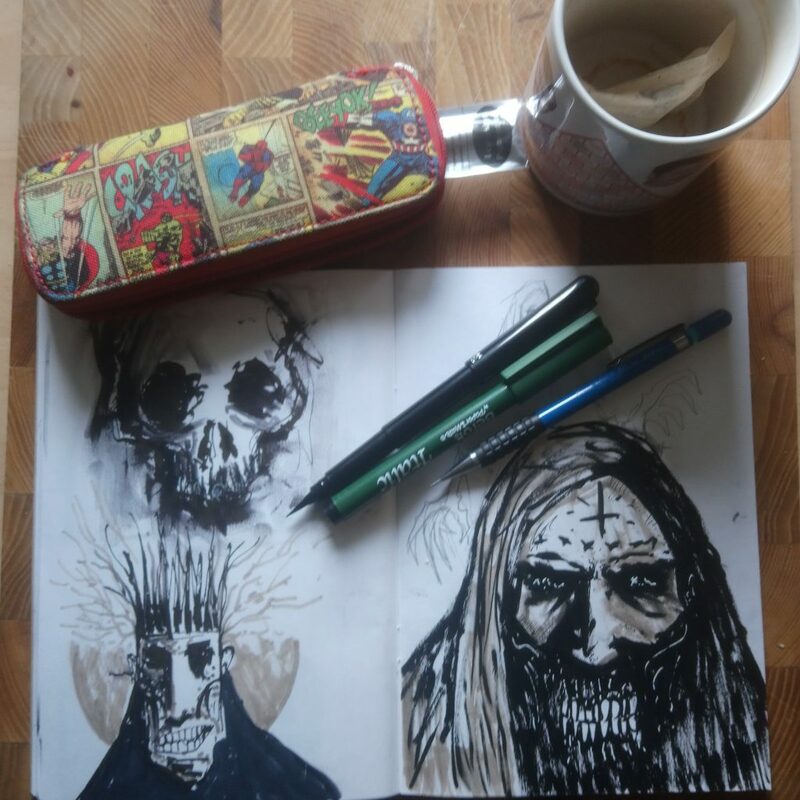 If you check out my instagram , you’ll see I’ve started a small sketchbook with skulls for April. I keep drawing them in my normal sketchbook , but just wanted to challenge myself from a Inktober point of view, which I usually fail. Due to the fact we are immanently about to move house, I’m having to pack away a lot of my art kit bag so I’ve had to reduce whats on hand. The small sketchbooks and 4 pens at hand are a great way to keep me drawing. I find if i stop, it takes me a while to get back into the flow of things. Plus, if I have to keep unpacking bloody boxes , the very thought will put me off and I go watch some crappy TV instead. Deadly!!!! 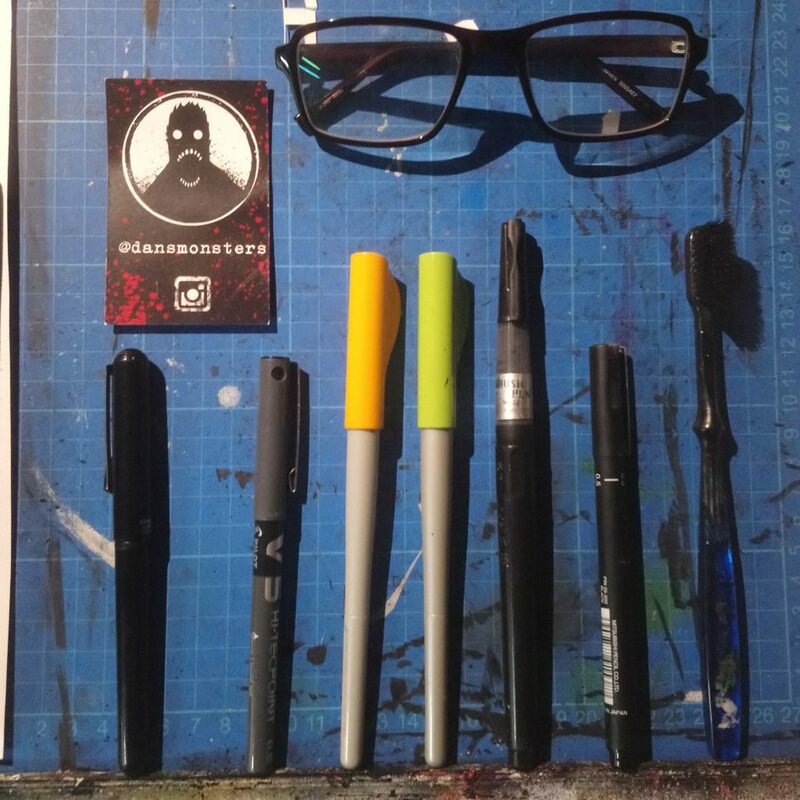 So, now I carry my little sketchbook ( and bloody glasses now ) with me everywhere. I’ve actually found that by limiting my tools I’m actually taking my time and developing dome great ideas and refining my skills. Well, hopefully. Check out my Instagram page and let me know what you think? On another note, I watched Jordan Peeles Us this week. Please go see it. Creepy, horrific, terrifying and brilliant. I don’t know how he does it, but it’s great. Plus re-watching some classics, Halloween and Alien so far. I’ve not watched either for a long time. Halloween still hold up after all these years, even though it’s been copied now a million times over. Alien, it’s attention to detail and slow build up of dread is still as nail biting as it ever was. Fantastic stuff. Podcast recommendation would be Shadows at the Door. It’s a great combination of original and classic macabre story, but the creators have a conversation afterwards about the story ,the influences and general themes surrounding a particular type of tale. Well worth a listen. Thanks for reading, sorry for the delay!! Once I’ve moved this should be more regular!!!! Don’t forget to check out Instagram and twitter , plus take a read of my stories over at Bloody Pens . Keep checking under the bed!